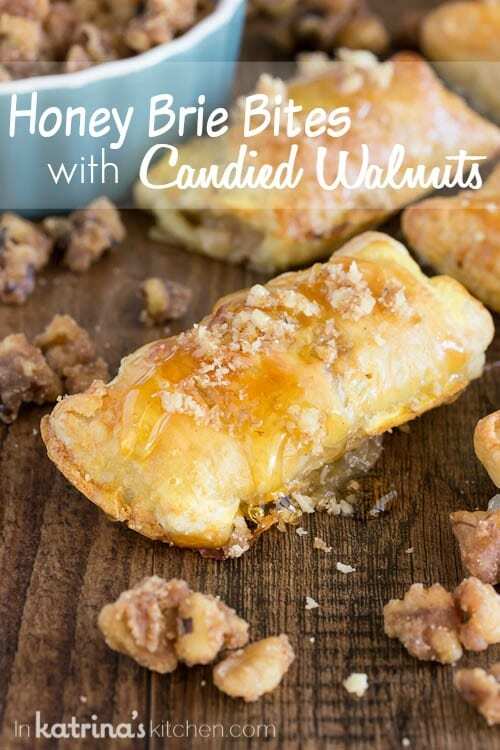 Easy appetizer for your next gathering- Honey Brie Bites stuffed with brown sugar candied walnuts then drizzled with warm honey. This month I’m teaming up with the American Dairy Association Mideast for some recipes featuring one of my favorite things in life- cheese! You can grab a bite of them at the BlogHer Food Conference on November 6-7. The hotel staff will be preparing my recipes and sharing them with all of the attendees so be sure to hop over and chat! I would love to meet you. 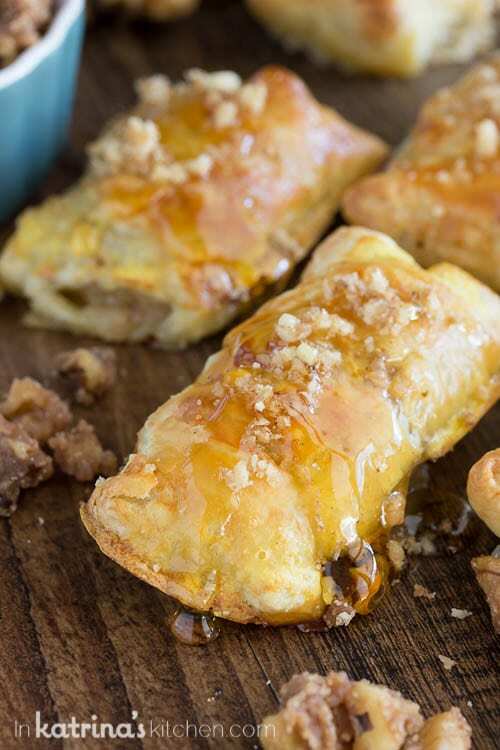 In these irresistible bites you will find creamy brie wrapped in flaky puff pastry along with honey and Brown Sugar Candied Walnuts. To top it off we’re drizzling the pastries with warm honey and a few more crushed candied walnuts. You’ll be coming back for more! 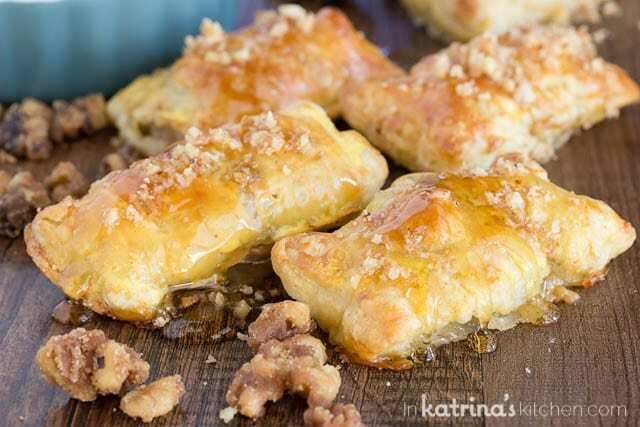 As we gear up for the holidays you will want to tuck away some recipes that ear easy for entertaining guests- and these Honey Brie Bites are so easy (practically effortless!0 to prepare. You can even prepare them in advance and freeze them before baking. They’ll be ready for you to pop in the oven when guests arrive. When preparing your brie for this or for entertaining you DON’T have to throw away the rind. The whole rind is edible! Just slice and serve. You do want to be sure to bring your brie to room temperature (about 20-30 minutes on the counter top) before serving to get the best creamy texture. I’m sharing the easy prep for this recipe over on the Drink-Milk blog so be sure to go over and print the Honey Brie Bites recipe. You can certainly use plain walnuts as a substitute but I suggest taking 10 minutes to make these Brown Sugar Candied Walnuts. They’re perfect for all holiday recipes and you’ll be happy to have them on hand. I’ll be serving these on Nov. 6 from 6-7:30 p.m. at the American Dairy Association Mideast Booth. Hurry, samples are limited! Wow, these look amazing!! I need these for my holiday party this year! These look fantastic!! I can’t wait to see you!! Oh they look fantastic! Just irresistible! Oh my gosh I can NOT wait to try these!! Brie is my fave!! These sound like a fabulous snack! So tasty! My mouth is watering!! These honey brie bites look incredible. Perfect flavor combos going on here! This looks incredible! I’m totally making this for the holidays!